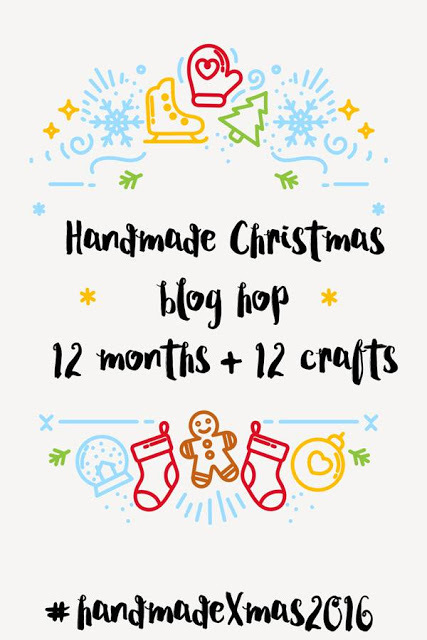 I'm part of a group of twelve creative bloggers who have joined together for a 12 Month Christmas Blog Hop where one of us will be making a fabulous handcrafted Christmas gift for us to be inspired and re-create each month! Our goal is to make one handmade gift a month for 2016 and by christmastime we'll really be ahead of our holiday gift making! Making coasters for gift giving is real popular among our group! Millie was inspired by Stella's Crochet Cat Coasters to crochet a Mickey Mouse coaster. I love Disney and was inspired by Millie's Mickey Mouse Crochet Coaster! But since I don't crochet, I came up with the idea of using string beads that I got during a Christmas clearance sale a few years ago and made a beaded Mickey Mouse coaster! How cool is that! The beaded coaster was easy peasy to make! I used a Styrofoam cup to trace the head on a foam sheet and a smaller plastic one for the ears. Other supplies included Fabri-Tac fabric glue, scissors and the string beads. Cut out Mickey's head after tracing a head on the foam sheet using cups the cups. Apply glue to the center and begin coiling the beads around in a circle. Continue adding glue and coiling the beads. Once the head is coiled, continue to the left ear, this time applying glue on the edge first, coiling the beads toward the center - making sure to add glue before coiling the beads. Cut off excess beads once reaching the center of the ear. Add glue to the area between the ears and on to the right ear. Run the beads along the glue, coiling from the outside, into the center. Cut off excess beads. Straighten and press down beads, if necessary, while the glue is still wet and then allow to dry. Enjoy your Mickey Mouse Coaster and be sure to make several for gift giving! Please check out our Handmade Christmas items below that we've made so far! Super cute coaster! My mother LOVE Mickey, and I'm always looking for Mickey Mouse craft ideas, so I can make things for her, so thanks for sharing! Thanks, T'onna! I thought about adding a bow to the front and a magnet to the back to dress it up a bit! Such a clever take on the original idea. I really like the beads that you have added Gail. Thanks, Mary! Mickey Mouse is an easy theme to make something using the beads. I've had them for a few years and couldn't come up with anything else. WOW Hats off to you Gail...what a creative idea!!! Another creative idea! So fun, Gail! How cute!! I love it! I love Disney crafts! Thanks for sharing with us at Creatively Crafty #CCBG.